Whole House Spin Down Pre-Filter installed generally right after the water meter to remove sediment, rust, sand and all other Impurities from tap and well water. This filter is the first line of defense to your appliances (water heaters, water filters, washing machine, and bathing facilities) because it blocks harmful particles before they reach the rest of your plumbing system. 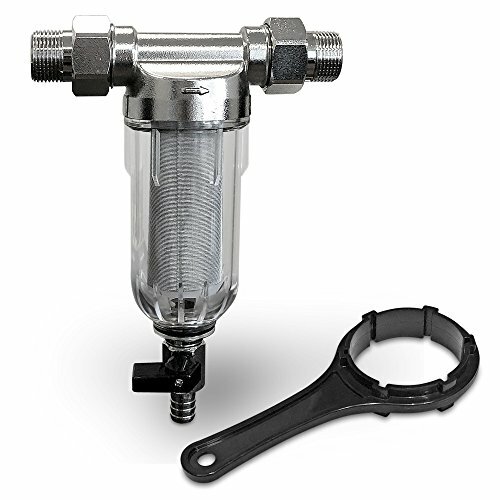 The long-lasting SUS316 stainless steel mesh and the drain valve provide for easy cleaning and continued use of your filter. When the cartridge begins to get backed up by the sediment, simply open the drain valve to flush out the system, removing any impurities. Such maintenance should be performed regularly (daily or weekly), depending on the water usage, sediment amount and the hardness level. When the stainless steel mesh starts to clog and simple flushing is not enough, the steel cartridge should be removed and clean with a brush. If you have any questions about this product by Ronaqua, contact us by completing and submitting the form below. If you are looking for a specif part number, please include it with your message. Hydrofarm Active Aqua Carbon Block Filter, 10"